"DO NOT TEASE OR FEED ALLIGATORS"
Sounds about as intelligent as taunting that tiger at the San Francisco Zoo on Christmas Day, the one that killed a young man and threatened his two companions. 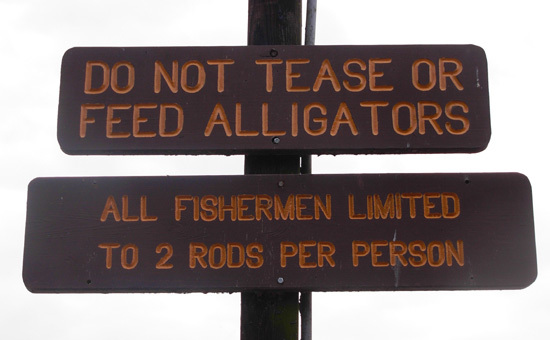 Nope, I'll never tease an alligator! 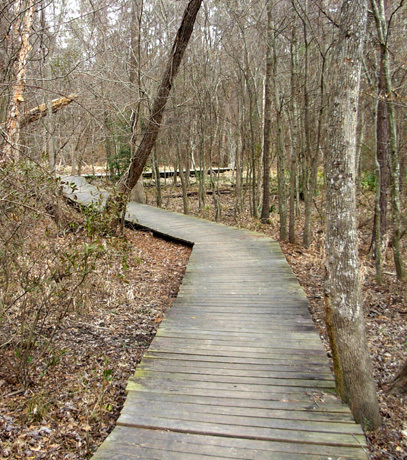 This is the third time Jim and I have been to Huntsville State Park and we have yet to even see an alligator there, although they are reported to be living in and near the lake. 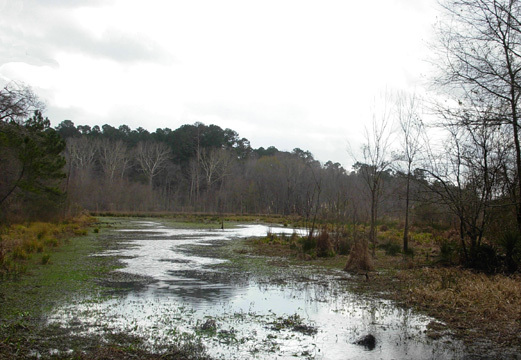 There is plenty of water and swampy land in the 2,083-acre park to accommodate them, too. 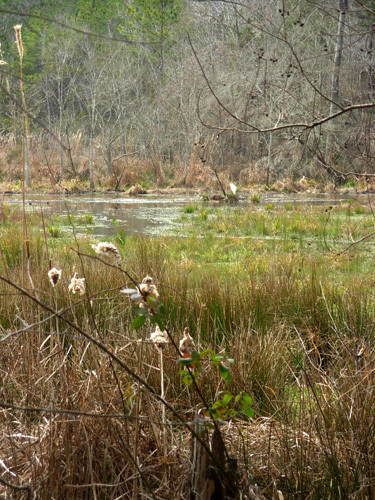 Many sites in the three campground units are closer to the water -- and the possibility of 'gator inspections. 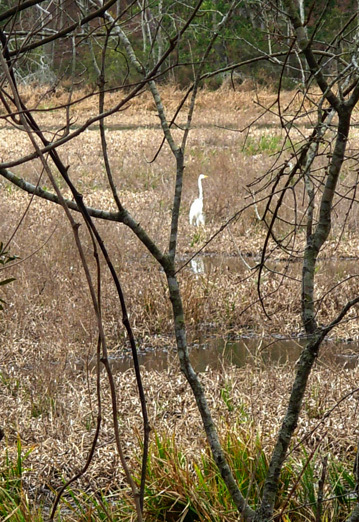 We did see lots of other wildlife in the park: whitetail deer, squirrels, migratory waterfowl, and other birds, but no armadillos, 'possums, raccoons (after which Jim's impending race is named), or alligators. Phooey. Yesterday we drove 255 miles from Fort Sam Houston in San Antonio to Huntsville State Park, located about an hour north of Houston off I-45 and six miles southwest of the small city of Huntsville. 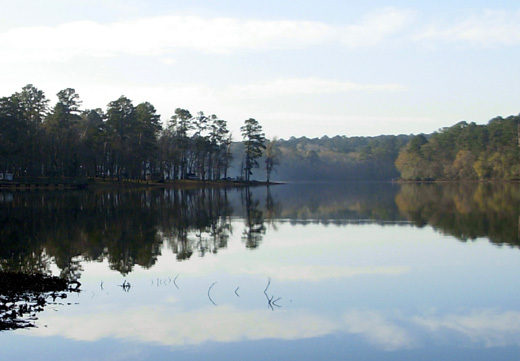 This is the "piney woods" region of southeastern Texas. 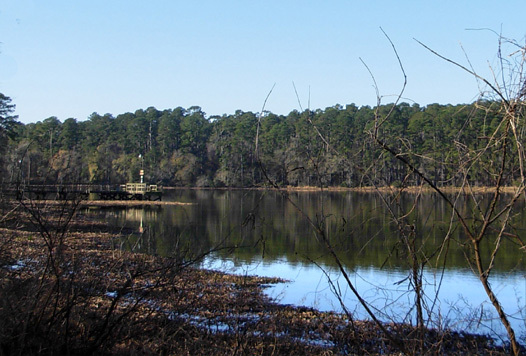 The state park is surrounded by the Sam Houston National Forest. Hmm. We seem to be following that name from one place to another, don't we? This soldier / politician / statesman left his mark not only on Texas, but also on Tennessee and Virginia. Houston was born in 1793 on his family's plantation in the Shenandoah Valley in Rockbridge County, Virginia. (Bedford County, where we live, shares a border with Rockbridge County northeast of Roanoke.) When his father died fourteen years later, he moved with his mother and eight siblings to Tennessee. For a period of time he lived with a Cherokee tribe and was adopted by them. In his 20s he served in the Army for eight years and fought against the British in the War of 1812. Houston became successfully involved in Tennessee politics. He served in the House of Representatives and became Governor of the state. A fight with a Congressman and a high-profile trial led to his emigration to Texas in 1832, which was still under Mexican rule. He became a leader of the Texas Revolution and successfully defeated Santa Anna at the Battle of San Jacinto, as mentioned in the last entry. He went on to become President of the Republic of Texas, U.S. 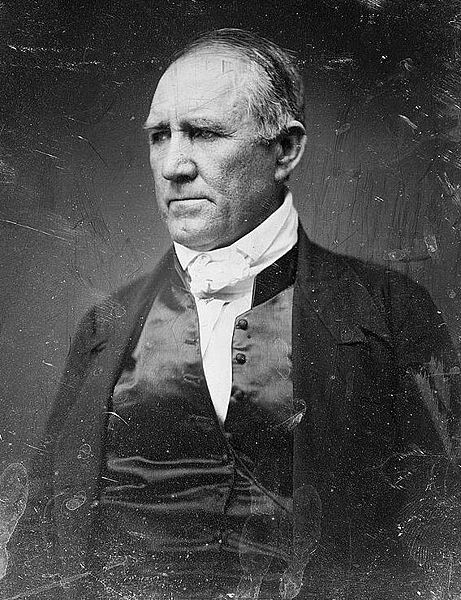 Senator for Texas after it became a state, and then Governor of Texas -- the only person in U.S. history to be governor of two states. His governorship ended because he refused to join the Confederacy when Texas seceded from the Union. Houston retired to Huntsville and died before the end of the Civil War. Thank goodness for Sam Houston. He's less controversial than the topic of capital punishment. 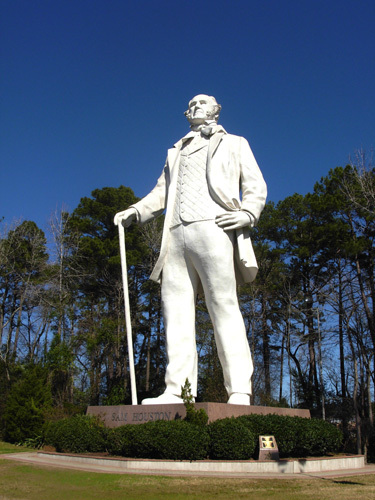 In addition to the statue (the largest of an individual American hero in this country), Houston is honored in Huntsville with a museum and a state university. Two of his homes are here, as is his gravesite. There are many other tangible and intangible monuments to his memory in Texas and around the country: a really big city, one of the largest army posts in the country, a submarine, a library, a coliseum, a national forest, historical and other parks, schools, and numerous streets bear his name. That's better than some former Presidents! I've only covered the highlights of this remarkable man's life. You can read lots more about his public and personal life (like his marriage to a Cherokee Indian woman) here or do an internet search for other more scholarly sites. 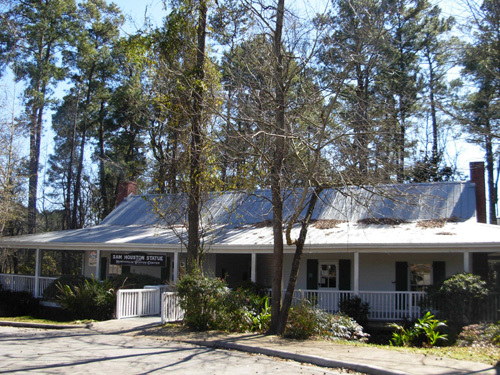 I went to the visitors' center (above) one afternoon while Jim was preparing for his race so I could get the photo of that statue above. It deserved more than one of my "windshield shots" from our moving truck, and there are signs along the freeway admonishing startled drivers not to park along the road to gawk or take pictures. (OK, the signs just say "No parking.") There is also a memorial museum on the campus of Sam Houston State University but we haven't gone to it. Next time. 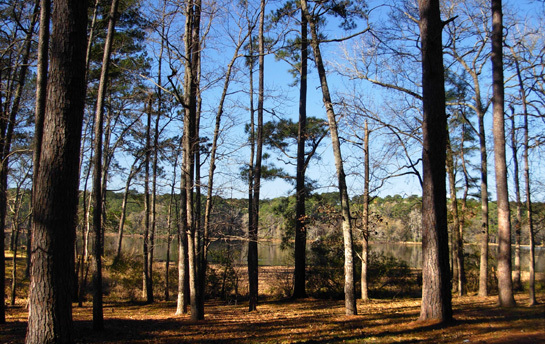 The area around Huntsville is more hilly and heavily wooded than San Antonio or Houston. We like it. 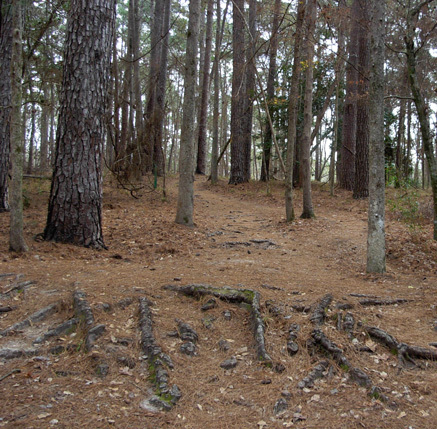 What they call the "piney woods" are full of loblolly and shortleaf pine trees, plus palmetto and other shrubs that stay green all year, as well as deciduous hardwoods with branches that are still bare in early February. There isn't much in bloom here, either. The upside is that you can see the lake better from the trails and you have more views through the woods before the leaves come out. This is the first time we've camped at Huntsville State Park. We really like it, too. When we ran the Sunmart 50-miler in the park on two previous trips we stayed in motels in nearby Huntsville. 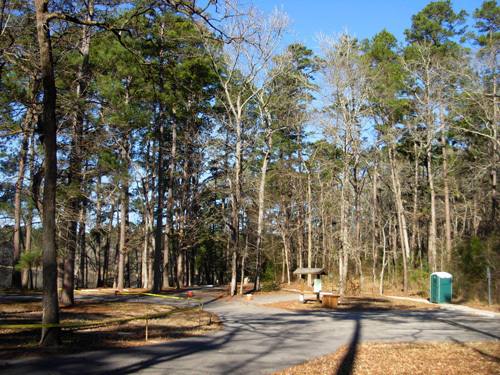 The three campgrounds inside the park are a great option for either the Sunmart races (50K and 50 miles) in December or Rocky Raccoon (50 and 100 miles) in early February. The Prairie Branch unit where we reserved a spot is closest to race headquarters at Raven Lodge. Our site at the far end of that campground is about a half mile from the state/finish area used in both races. Most of the sites in our campground are spacious. All have trees, water and electric hookups, and picnic tables. 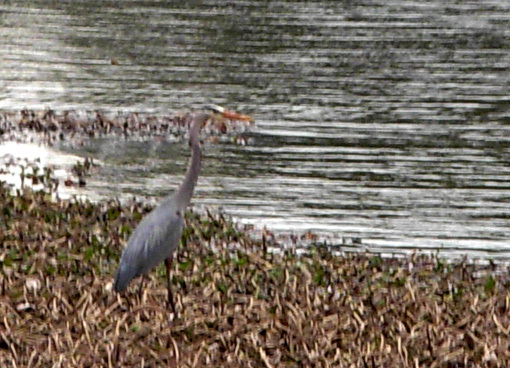 Some are right next to the lake (and the alligators!). A restroom is centrally located. There are both RV and tent sites. 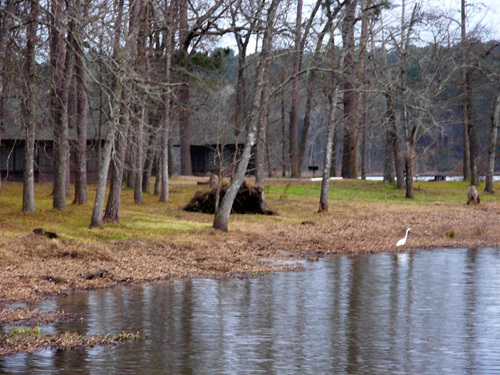 Between our campground and the recreation building are several screened shelters for overnight guests. There are two other campgrounds with 121 sites across one arm of the lake. We haven't checked them out, but they are reportedly similar to ours. This is a good "destination" park and a nice place to relax if you aren't running a long race! 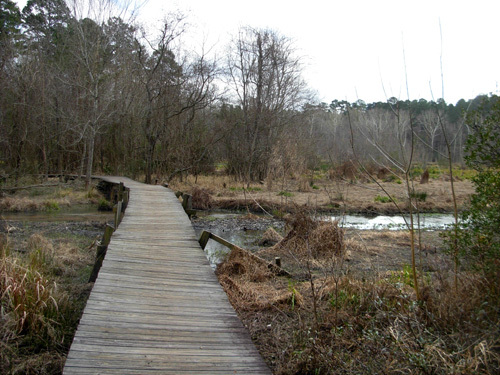 There are nineteen or twenty miles of well-maintained hiking, biking, and equestrian trails, several dirt jeep roads to run or ride, a stable, picnic areas, a park store (Gator Junction), lodge, nature center, and lots of places to view birds and other wildlife. 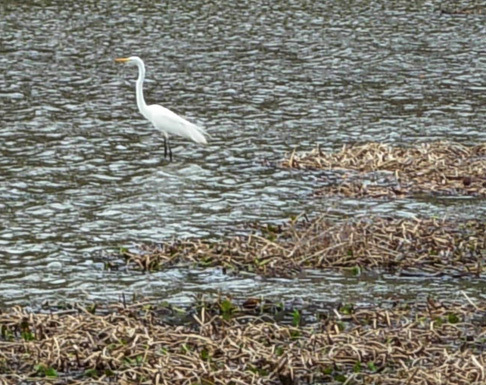 We saw numerous elegant white egrets (above) and blue herons (below) around the lake. 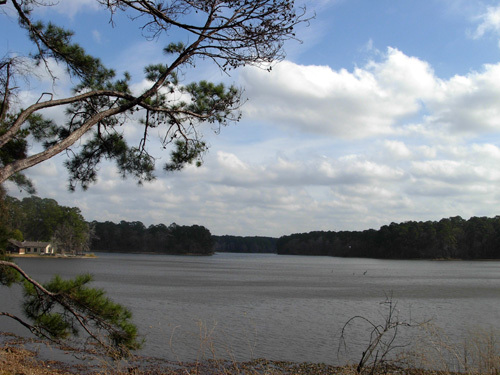 Lake Raven is popular for swimming, fishing, canoeing, kayaking, sailing, and idle-speed-only motor boating. As warm and humid as it is in late winter, I don't think I'd want to live here in the summer. A morning shower before we arrived yesterday brought with it bright blue skies, wind, temperatures in the mid- to upper 70s, and sticky air. The average LOW in January is 50 degrees and the average high is in the mid-60s now. You can imagine how hot it is in August. There are good reasons why the Sunmart and Rocky races are held in the winter! This weekend the temps are above average, in the 70s. Add in the humidity, and tomorrow's runners coming in from everywhere around the country, mostly north of here, are going to be uncomfortable. Note that there are bugs here even in the winter. Sunscreen and bug spray are needed year-round. With rain comes mud. 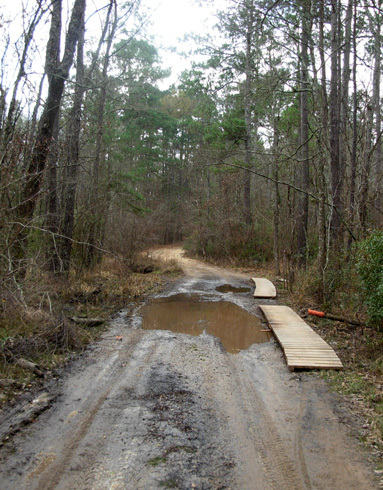 After this week's rain, just how bad will the trails be tomorrow for the race? Just one more thing for Jim to worry about! Since I'm not tapering for the race, I decided to check out a good chunk of the course. I'll be pacing Jim mostly at night and won't be able to see anything then. 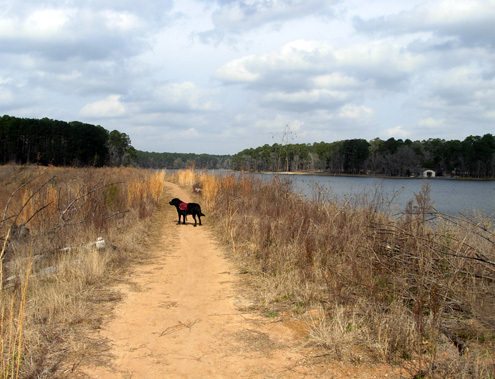 Cody accompanied me as I ran and walked a 10+ mile loop around the lake, using some of the same trails Jim would be running but very little of the jeep road portions. Some of my photos are scattered throughout this entry. Here's a map of the trail system. To read what it says, go to the park's web site and pull up the pdf. file with a map you can enlarge and/or print. I just want you to get a general idea of the park's layout. 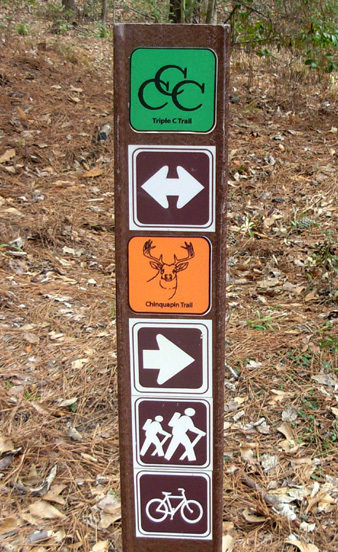 See the trail system in orange? 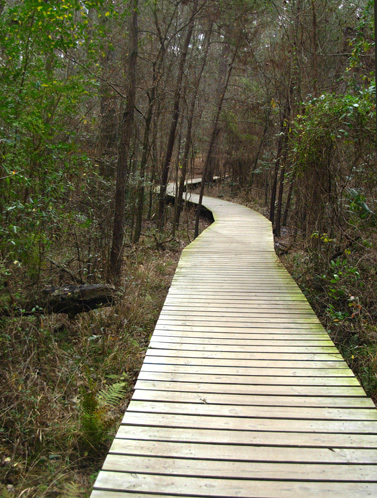 The Rocky Raccoon races follow most of those trails. There are also three out-and-back segments on jeep roads to the Far Side, Highway, and Main aid stations. Most of my photos are from the trails, not dirt roads. I started from our campsite, walked up to the nearby Site 174 aid station (this campsite number no longer exists, by the way), ran the Prairie Branch Loop Trail to its intersection with the Chinquapin Trail, and followed the well-marked Chinquapin Trail in a clockwise fashion past the nature center and generally around the lake and back to the Prairie Branch Trail. That's the same direction the Rocky Raccoon runners go, except they start and finish each of their loops from Raven Lodge, which is barely visible in the background of the next photo I took from a pier in our campground:. 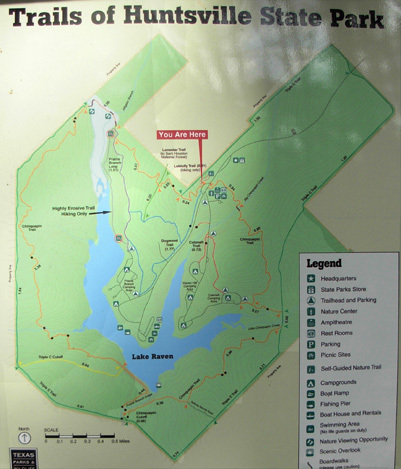 On the map above, the lodge is located at the end of the peninsula of land right above where it says "Lake Raven." 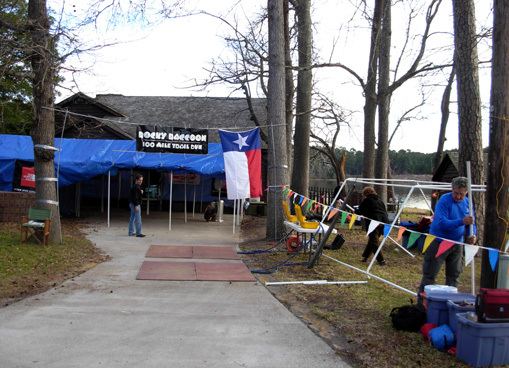 The lodge is used as race headquarters for the Sunmart and Rocky Raccoon ultras. 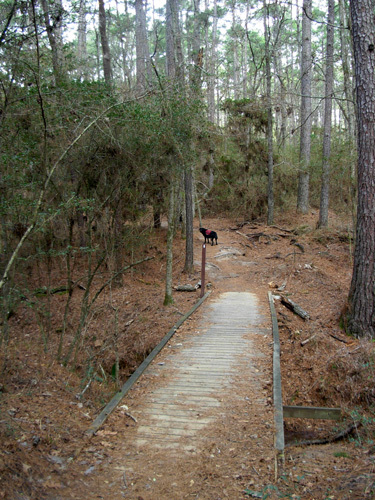 Most of the trails in the park are multi-use for hikers/runners, cyclists, and equestrians. Some are for hiking only. 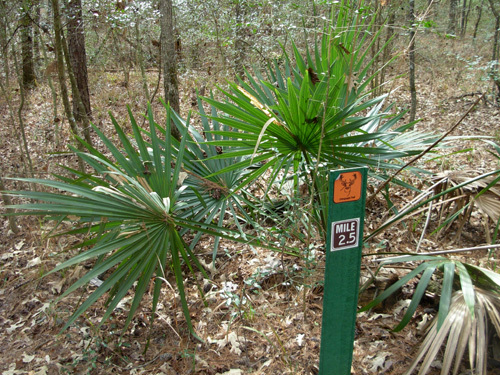 All trails and intersections are well-marked. 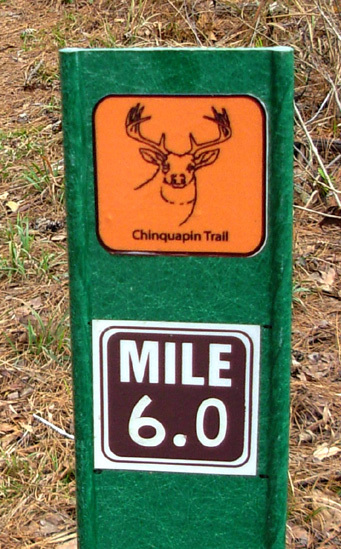 The main Chinquapin Trail is marked every half mile, which is convenient for pacing oneself. On most trails we run we can only guess at the distance, even with a GPS (because of tree interference with satellite signals). 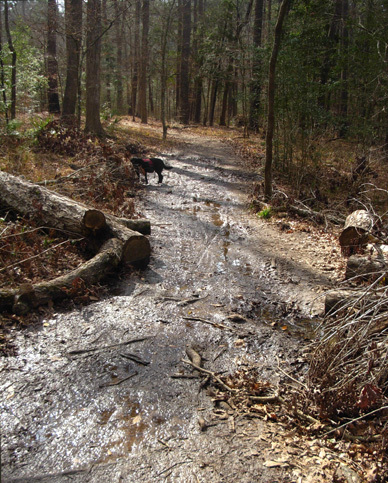 Trail surfaces are mostly very runnable, even for the Queen of Klutz (me!). In the next photo Cody returns to a smooth section of trail after checking out one of the numerous wooden stands in the park -- never did ask what those are for! 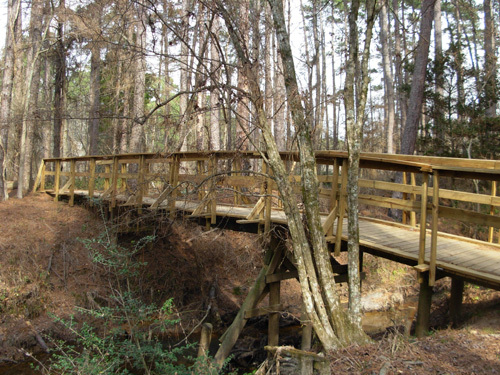 and lots of bridges over creeks . . . 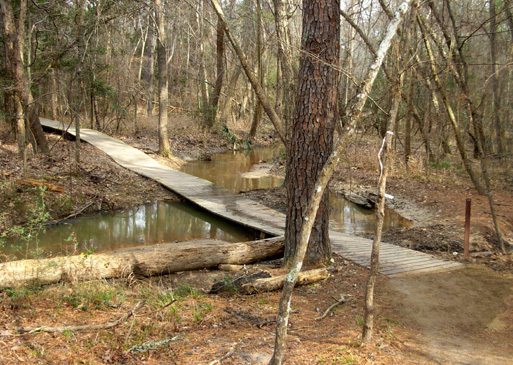 The Rocky race web site also has good photos of the trail surfaces and conditions. Click on "pictures," then "picture tour." 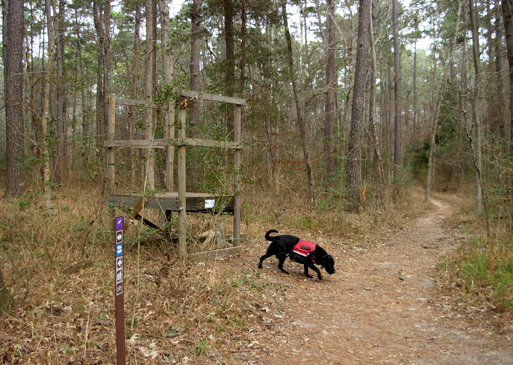 I'll have some more photos of the trails and scenery in the next entry, which covers the Rocky Raccoon 100-mile run. 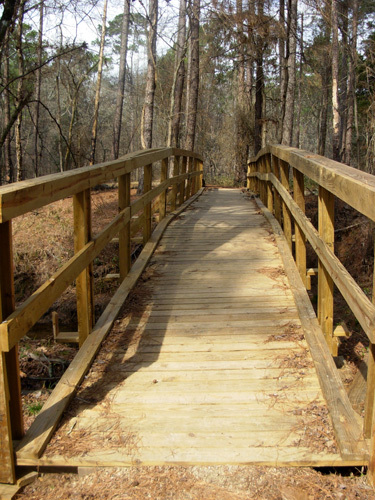 We're glad to be back in Huntsville State Park again. Now let's get on with this race!